Why some brands and products are more expensive than others? More often than not, you get what you paid for. Always check the ingredients label to ensure the product contains no filler and/or fragrance (another term for synthetic scent/perfume) as they cost a lot less than the pure essential oils, resins and absolutes (plant concentrates). Furthermore, all the ingredients we use are of premium quality and sourced from suppliers located within Australia. How long will the scent last on my skin? or How to use a Christy Organics Natural Perfume? How to store a natural perfume (Storage information)? or What is the product shelf life after opening? Answer: It is recommended that the perfumes be used within 12 months after opening as our perfumes are formulated without synthetic preservatives or additives. For the same reasons, Christy Organics perfumes are best stored below 30°C and away from direct sunlight. What currency is on the website? Answer: The default prices on the website are in Australian dollars and are inclusive of GST (where applicable). You may select to view the product prices in another currency by selecting the currency on the 'currency drop down box' on the top right hand corner of the screen. What are the payment options/methods? Answer: We accept PayPal only. We do NOT store your financial/bank account or credit card details. Please contact us if you choose to pay via Direct Deposit. We will advise you the details of our bank account and you will be required to email your official Direct Deposit receipt to us so that your order can be dispatched promptly. Orders can be delayed if payment confirmation is not presented, as we will have to wait for funds to be cleared. All orders must be fully paid for prior to shipping. Please Note: We are working on offering credit card payment option in the near future. Answer: Our preferred carrier is Australia Post. Free shipping (with Tracking Number) for orders AUD$89.99 or more within Australia and internationally (selected countries only). Which countries and regions do you ship to? Answer: We ship to - USA, UK, Canada, Japan, Hong Kong, Macau, Singapore, Malaysia, New Zealand, Taiwan, Brunei, Sweden, Germany, Netherlands, Switzerland, Denmark, Belgium, Ireland, Norway, Monaco, France, Luxemberg, Finland, Austria and Australia. If your country is not on the list, please contact us using the 'Contact us' Form on out website and we will obtain a shipping quote for you. For a faster response, please message us on Facebook or Instagram (Our social media handle is @christyorganics). Can I have a shipping address that is different to my billing address? Answer: Yes, you can. Please ensure that the delivery address you entered on your order matches your PayPal delivery address. Can I send my order to a P O Box address (Post Office Box)? Answer: Yes, you can. However, Please Note: If your order is returned to us because no one was there to accept delivery of your order or refusal to accept the order, we will refund your Paypal or debit/credit card as follows: You will be refunded the total amount of the order, minus the shipping & handling charges (Expenditure of Christy Organics), and 20% of the value of the order, (as a re-stocking fee). We will also subtract any other outside charges ChristyOrganics.com has incurred during shipping, such as warehousing fees, return postage fees, etc. If the cost to return the product to us is larger than the cost of the refund due, we will instruct the carrier to abandon the order and there will be no credit for the order. If the product(s) is not returned to us, there will be no credit processed for the product(s). Refunds will not be issued until we physically receive the returned goods/products/packages. Is tax or GST (Goods and Services Tax) inclusive in the prices? Answer: 10% GST is inclusive in the advertised prices for all Australian orders (i.e. 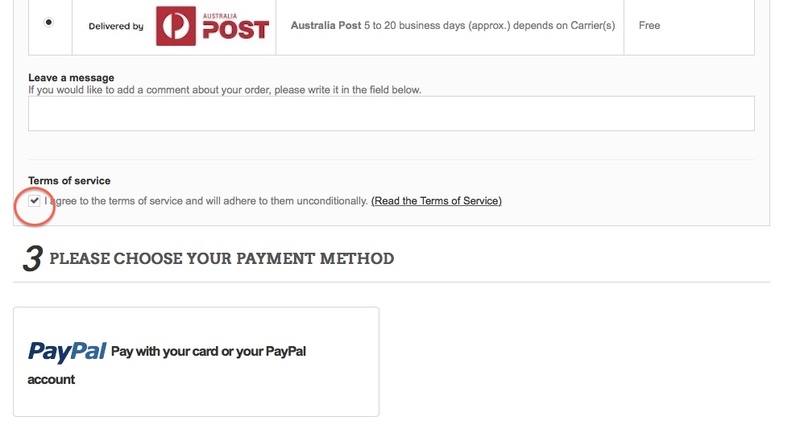 orders with delivery addresses in Australia). No tax or GST is applicable for International orders (i.e. Orders with delivery addresses outside Australia), the prices are as advertised/shown on the website/product pages. If you prefer to speak with us, please contact our Customer Services on +61450 225 606 (open 9am - 5pm AEST, Monday to Friday) or Contact Us on our website. Why is there no payment method button or feature? or "I'm having problems on the Check Out page....."
It will take you to PayPal's website, on PayPal's page select [create a PayPal account] button or link and pay with your credit or debit card.